In and out I moved the hook through the piece, building the blanket stitch by stitch, row by row, enjoying the feel of working with natural fibers and the subtle colors, muted graying browns, tans, charcoal, beige and blue. hour after hour I built the blanket from nothing more than an idea in my head to something tangible. The more it grew, the more apparent it became that something was off…maybe? Was it my imagination? I kept going for it wasn’t clear, and the pattern of back and forth stitches interwoven with a row here and there of slight texture was pleasing to my eye, to my hand, and the piece emerging soothing in the color and composition. But there, there at the edges. What am I seeing? A couple of nights ago I sat and counted the stitches. Sure enough, I had lost 7 stitches over the course of about 30 rows. 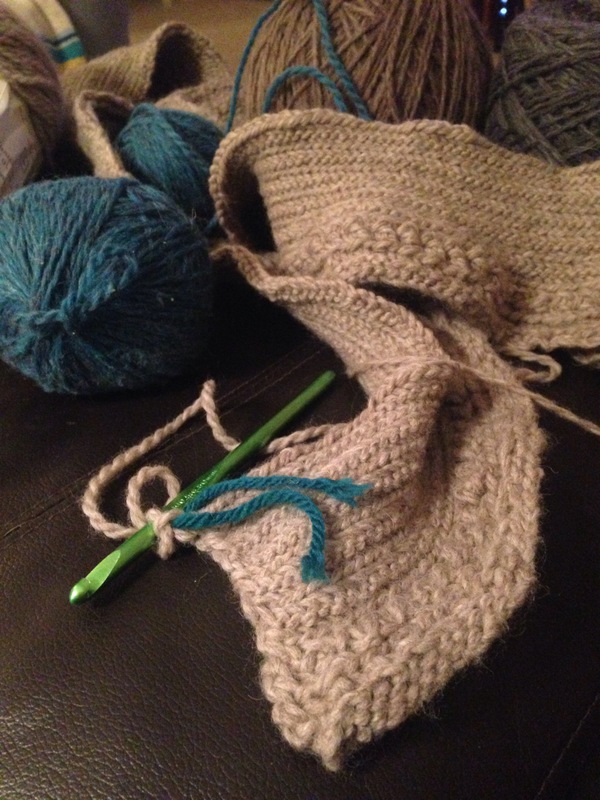 So sometimes as I turn the ends I am missing a stitch…not always, just sometimes. I set down the work of about 20 hours in frustration. All that time! All the pain in my hands! I knew I was going to have to rip it out, as I can’t deal with the obvious imperfection. There are enough flaws I cannot fix, the slightly uneven stitch here and there, the natural variations in the fiber, but this? This I knew I would have to fix. I knew this, yet I argued with myself over whether I could live with it, knowing I could not. I was avoiding the inevitable. So last night, I began the lengthy and heartbreaking task of ripping out all of that labor, all that hard work, painfully winding all of that yarn from my elbow to hand, round and round and round as I ripped, slowly and steadily, stitch by stitch. It was a bitter feeling to undo the efforts of my pain-filled hands. My thoughts tend to wander down rabbit trails until, distracted by something, I take off on a deer trail, a squirrel trail, wandering until I can’t remember where I started or how to get back there. That being the case, I’m pleased that I got all that undoing done, and all the yarn wound into cakes, ready to be reworked. This time I have come up with a solution. I mark the spot where the row turns, the stitch that needs to be the last one in the next row. Since doing that, I have reworked row upon row, losing nothing in the process. The marks surprise me almost every time, appearing to be further than I could possibly need to go. Since it is marked, however, I am confident in slipping into that one last stitch before turning to begin a new row. 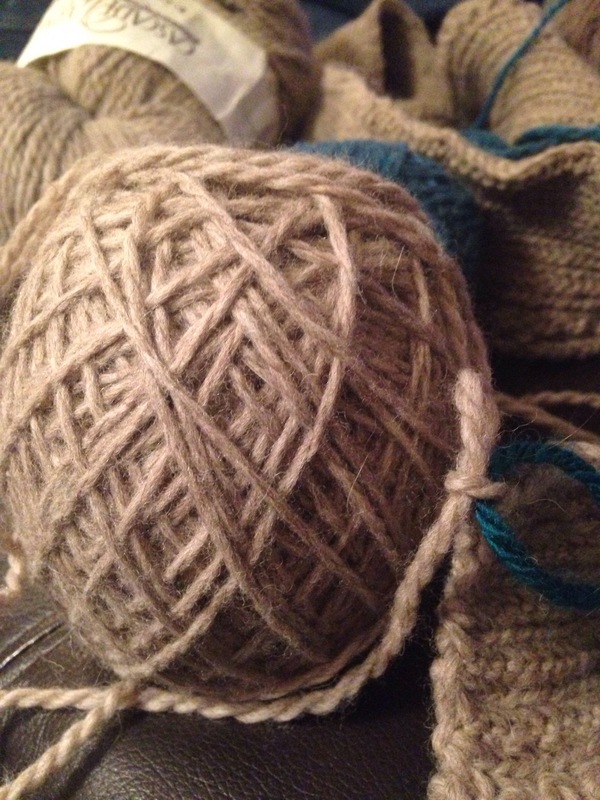 I move my marker (a simple strand of contrasting yarn pulled through the stitch) and am off to work another row. This undoing, un-stitching, and reworking is life. Sometimes we get to a place that, hard work notwithstanding, we look back and realize that we have gotten off. Our work, our relationships, our health, our doing is producing skewed results and we have to go back to where we went wrong and rework, redo. The markers of where we go off track may come as a surprise to us. To me, it came as a huge surprise to realize how judgmental, how fearful, how cowardly I was. I have to put markers in my path to stop myself. I have to mark my way with prayer. I have to regularly talk to my spiritual father for guidance, and it doesn’t seem to matter how many times I do that, I need the same reminders. It helps to look back more frequently, to review and evaluate to see if I’m getting off track. It’s easier to undo a few stitches than a few thousand. just as it’s easier to retrace one’s steps, to get one’s thoughts and habits back on track when we review regularly so the bad habits don’t have a chance to take hold. My goal both in this crocheting project and in life is to learn to recognize those points where I am often go astray. What are those things that draw me off course? Paying attention and living deliberately is where I have those markers. I read this back to myself and understand that this is something I accomplish SOMETIMES. Other times I am completely overwhelmed by the stresses of life. Sometimes I am thrown off kilter by news out of the blue: “Come to the hospital, there’s been an accident.” Or, “I may not be able to work again.” The list could go on, you know. The seemingly endless series of unfortunate events of the last year sounds made up. I sometimes recite the events of the last year aloud as if in the saying of them I can get my mind to believe the truth of them. My mind resists. My strong, proud husband attacked and badly injured by a stranger over a parking space. In the middle of a sunny afternoon. The many surgeries of my brother-in-law beginning just three days after he came to stay with us “for a month.” The layoff, the car accident, the amputations, the endless round of hospitals, ER visits, PT, home health care, MRIs, etc. I’d like to say they culminated in this final surgery, but the culmination asserts that this is the pinnacle, after which things calm down and get back to “normal.” I no longer believe that I am qualified to determine what is the end of this. There is no end, no blissful pasture beside still waters at which all troubles cease…not in this life anyway. The peaceful pasture may still be there, but perhaps it is a place of the heart, not a place of the body and circumstances. There are mini-pastures and still waters in the services of the church, and when there is not a service, there is still the nave, with the altar front and center, the icons of the dear Saints, Martyrs, Apostles, of the Theotokos and of our Savior, Christ Our God. This is a holy space, and I bring my troubled, anxious heart in prayer here and receive grace and comfort. There are still waters in prayer, in scripture, in the message from a friend, in the call of a bird on the wind, the gentle music of falling leaves, should I stop to take in the moment and hear the whisper. I keep thinking about this undoing. It is a metaphor that resonates with me. How many times have I had to go and undo? I look back and cringe at the person I once was, knowing that I probably should be cringing at the person I am. I think of the vile, judgmental attitudes, of the cruel barbs that have flown off my tongue, of the cowardice and fear that plagued me. I was silent when I should have spoken, spoke when I should have been silent, manipulated rather than addressed directly, ran when I should have stood my ground. Ah, it is an ugly picture. But as well as I am able, I am going back, undoing those stitches I put in, making amends as well as I can and reworking. Hopefully what comes out of this painful process is beautiful and straight, if not perfect. To learn to do this differently, I have to study where I went wrong and very deliberately choose to do it right as I turn the corners, I have to study how to do this well, by carefully learning from those who do it well, and letting them examine with me where I am dropping a stitch. I’ve started reading Frank Schaeffer’s “Dancing Alone: The Quest for Orthodox Faith in the Age of False Religion” and while I can relate to a lot of his coming to Orthodoxy story, I find myself challenged that I am living Protestant in the Orthodox Church. That is, the individualistic thinking and determination of a Protestant mindset has invaded how I try to live Orthodox. I decide for myself that it is okay to say my morning prayers while laying in bed instead of standing or kneeling before my icon wall. I decide for myself how much fasting I will or won’t do. I’m puzzled when people ask for Father’s blessing before doing an endeavor, in a way that proves to me that they will not proceed if Father does not give his blessing. I am baffled by the idea of asking permission to do things. After all, I think, isn’t it clearly my choice whether to go visit a monastery or not? Isn’t it??? And yet I find that those who have been Orthodox for a long time, culturally as well as religiously, ask. They go for a blessing before travelling. Holy water (or “blessed water”) is taken on a daily basis. Blessed bread is wrapped and taken home to be shared with someone who could not attend liturgy or to be eaten throughout the week. Some worry about recycling to the point that they are almost paralyzed into inaction because they cannot determine if it is more wasteful to throw away the glass jar or to use enough water to rinse it clean for recycling. These are not the trivial matters that they appear. They are evidence of lives that are intent on living their faith, lives of people who struggle to redeem the time, redeem the physical world in which they live, to live humbly in obedience and righteousness. I find myself saddened and sickened by how secular I have allowed myself to be. I read recently (I can’t remember where) that there is nothing that isn’t sacred, but there is sacred and defiled or desecrated. That’s mind-blowing, don’t you think? If everything is sacred, then I should be very conscious what I do with it. So I am going to speak with Father about these matters, so that I can get some guidance in how to live a sacred life so that I do not desecrate the sacred. And to repent of my independence of thinking that I know best how to live an Orthodox life. I don’t. Last night I went to confession. This is a sacrament which is so misunderstood in Protestantism, and I am only beginning to understand it. I accept it as a teaching of the Church, and as such I go to confession, at first hesitant, now willing, but still somewhat reluctant to share my sins and failings with another. God understands; others? Not so much. Or that is how I feel. But I am learning that I can say things to my priest that I would not admit to another human being. And so I found myself, after prayer and contemplation, weeping before my Father Confessor, and my Savior, Jesus Christ, in the sight of all that crowd of Saints who have gone before, in front of the Theotokos, and admitting my sins, repenting, and fearing that my tears are not solely of repentance but of self-pity as well. The God who forgave David is the same one who looks down on me with compassion. And in this life it is a great comfort to hear those words, “God forgives.” For it is not the priest who forgives me, it is God, and my confession does something that is hard to describe and explain. It is a building block in a wall of strength and forbearance in the future. I will confess to you that the words admonishing me to withhold nothing or be the more guilty (wild paraphrase), is a hard one for me. How does one make a full confession? If my sins are as the sands on the shore, I not only cannot know them all, I cannot begin to recall them during confession. Do I willfully withhold? I think that is the key, but I am not the expert here. Do not willfully withhold from your spiritual father. Hmmm. The correlation that comes to mind is seeing a doctor but not telling them all the symptoms. I don’t have a big, grand point to this post, but I wanted to explain in a small way what confession is in Orthodoxy. I remember having such a revulsion to the idea of confession, as it was related to Roman Catholicism, and as most Protestants will attest, anything that is remotely evocative of the Roman Catholic Church is to be avoided at all costs. Confession? Why that just means that you live like the devil all week, but go to confession on Saturday night and it’s all good. Genuflection? That’s just vain ritual and empty repetition. Robes and vestments? Showy. Chanting? Old and boring. I have now come around to where the beauty of these has been revealed, as if the curtain has been pulled back and I can finally see the truth, only the truth is more beautiful and more real than I had imagined. One of those beauties is in confession. But I don’t go to confession for beauty, I go to confession because it is a sacrament of the Church, and I have placed myself in subjection to her. Glory to God! In December, Steve was laid off. It was only supposed to be for a few weeks. It’s May 10th. He is still not back to work. He was supposed to go back yesterday, but there is another delay. I was laid off February 10th. I was off for just over two months, and have been brought back temporarily. I am highly frustrated by the delays, the fits and starts, the seeming randomness with which our lives are rolling along. My patience has worn thin and sometimes worn right through. I’m like Vizzini (“The Princess Bride”), hands thrown up in disgust, bellowing, “I’m WAAAAAAAITING!” The timing of our rescue is outside of my comfort zone. There is also utter humiliation in the situation. We live in a society that boasts that things are in your control. One who works hard enough, is diligent and smart, will succeed. That’s the promise, right? And since we are NOT succeeding, and have NOT been able to land those good jobs, have gone through our savings…then by definition we must be indolent…lazy…stupid. That this is not up to me is something I announce, but in my heart of hearts, that voice keeps whispering that we aren’t trying hard enough, aren’t being smart enough. Following hard on that whispered accusation is the dark thought that God is disinterested in us. That he cares not whether we are homeless, destitute…and that really, truly, he may be a God of Love, but his lovingkindness contains an awful lot of pain and devastation. Perhaps he has forgotten me? Perhaps I have not met his expectations for me, which seems odd, since he knows that I am dust. These are momentary reflections, but they trouble me more than I would like to admit, because they reveal the state of my heart—a heart that should be trusting, yet fears and doubts assail; a heart that should be patient, but is impatient for God to reveal himself; a heart filled with pride, that should be humble. In my impatience I hear those words echoing inside, whispering to me, After all we’ve been through together, after all this time, after all my goodness and faithfulness to you, can you not wait with me this one hour? It is the hour when he works in and through me, when he works his own purposes, when something greater than me is happening. Can I not wait and trust for this one hour? This one day? This month? This season? Can I not wait through this one trial? Can I not wait?